Today’s world offers tremendous capabilities with portable multimedia and communication devices. I hear the argument all the time that “real preppers” should stay away from modern technology. I disagree. These are tools and if available and operational use them to your benefit. Over the past couple years I have used numerous portable power banks to charge cell phones and tablets. I find these back up power resources very useful for when I am not near an outlet. Most of the devices I have used have worked fairly well for adding some additional usage time to my devices. 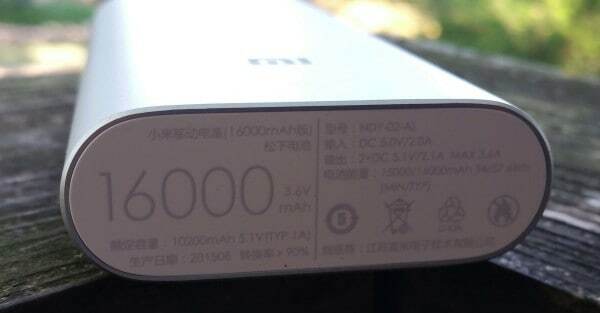 Just recently I have expanded to larger, higher capacity power banks and the main model I have used over the past two months is the Xiaomi 16000mAh. You may not be familiar with the brand “Xiaomi”. Over in China they are a leader in high tech devices such as cell phones, tablets and Bluetooth devices. I ordered the Xiaomi 16000mAh power bank from GearBest.com. By ordering directly from the country of manufacture substantial savings can be had. I paid $23.99 with free shipping. The intended use of the Xiaomi is to provide power on-the-go to charge cell phones and other portable electronic devices. It does NOT provide enough energy to power an inverter or jump start a vehicle. The Xiaomi is constructed extremely well. All lines and seams are very smooth. No machining marks are evident. The case is anodized aluminum and very attractive with rounded corners. Nothing shakes or wobbles. If an Apple logo was slapped on the side of it no one would be surprised as it is built with similar quality. The LED power level lights, USB ports and power button all work as they should. 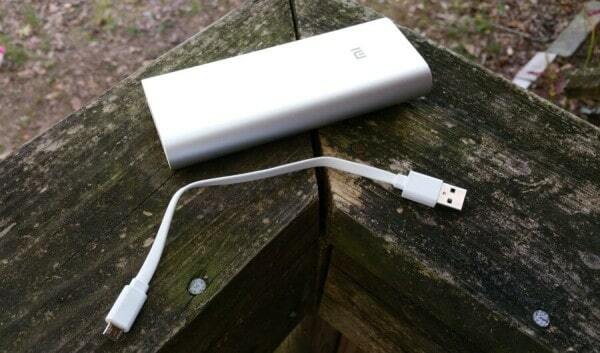 You don’t have to be a rocket scientist to operate the Xiaomi 16000 mAh. To charge it simply take the included cable plugging one end into the USB port of a wall outlet or PC, and the mini-USB end into the Xiaomi. Depending on the incoming charge the length of time to bring the unit to full capacity can take some time. In my experience from totally dead to fully charged was between 9-12 hours. To check how much power is available simply press the power button and the LED indicators will light up. There are 4 LED’s which represent 100%, 75%, 50%, and 25%. 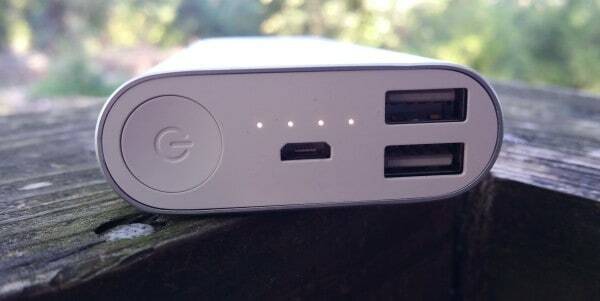 There are two USB ports providing the ability to charge two devices at one time. Each port will put out 2.1A which is enough to charge even the most demanding of today’s cell phones and tablets. Simply plug in your charging cable and then attach your device and the charging will begin. This is pretty simple: It works! For over 2 months I have carried the Xiaomi testing its performance and have been impressed. It does take a long time to charge however that is due to its large capacity. I have charged Samsung tablets, Samsung Galaxy phones, both an iPhone 5 and 6, and a crappy Blackberry. It will often charge these devices faster than a wall outlet depending on the amps of the outlet charger(many are only 1 amp). I have had no issues fully charging my Samsung Galaxy Note 4 multiple times – even while using during the charging. For a price of $23.99 it is a heck of a bargain. The Xiaomi 16000mAh power bank is a great tool for the pack, the home, or the office – just in case. I don’t mind utilizing technology. I don’t even mind utilizing technology in a adverse social environment. But, what I do mind (And to some extent this is difficult), is relying on the quality control of Chinese electronics (I don’t know the COO of the aforementioned). No offense to the Chinese people. I’m sure the average Chinese family just wants their children to grow up and do better that themselves (Parents), but my goal for preparation is to surround myself with tried and true reliable devices and techniques that have long proven track records. Everyone has to make their own decisions about what they feel is reliable. An unfortunate American example is the colt 45. Love the caliber but Sam could have done a much better job on the reliability. Don’t even get me started on these $600.00+ Chinese cell phones….. Probably should go get another cup of coffee before I throw mine out the window. Anyway that’s my jabberwocky. I hear you Rob. There is Chinese crap – and there is some fantastic electronic devices of Chinese origin. I am not a fan of the iphone but they are incredibly reliable. I am a Samsung Galaxy Note 4 user myself. How long did it take to receive it? Thomas – took about 3 weeks. The wait is worth it to save the money. It’s like Christmas wondering when the package will arrive.